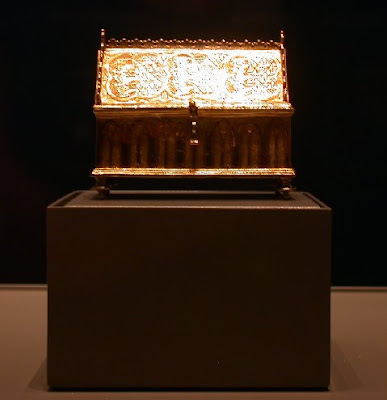 I planned my Sunday morning trip to the new Medieval Gallery at the British Museum in Bloomsbury, London, to tie up with the Oxford Vs Cambridge Boat Race that was happening, mid afternoon, on the tidal way of the Thames a short subway ride away. 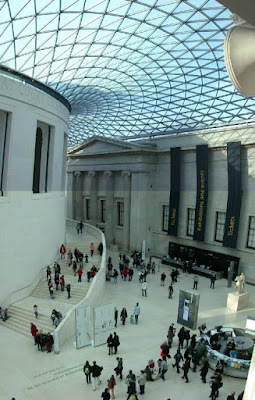 The British Museum is one of my favourite seven Free wonders of the UK, in that you could go there, just to stand in the Great Court, with it's new lattice glass roof, (pic above ) making it feeling like a futuristic bio-dome as designed by Georgian architects. My snapshot can only take in one small portion of the view and simply can't do justice to the vastness, and the pleasure you can get just whiling away your time while a shower of rain falls outside. But much as I would like to stand there all day, there are treasures to seek, as I outlined in my blog 'Middle Age Spread' 26th March. It was all that I hoped for and more, and I won't go through all the items again, ( and there were another 300 plus with them ), other than to mention that the gilt silver casket owned by Isabella of France when she was twelve, was the tiniest wee-est most beautiful little thing you could imagine... being barely 3 inches by 1 and half inches... it was a true Queen's treasure, with the finest craftsmen detailing on it. The real big plus was, that normally when I go to museums I get told off for taking photographs, when there are signs saying not to... This time I look around me and dozens of tourist are taking snaps in the huge gallery, and nobody got frogmarched to the door... so I trebled the pleasure I was having by taking non flash photos with my small Nikon, so I am able to savour it all again at home... This is unusual in England. A second item I wanted to show the Knighthood, is a beautifully painted 12th Century Knights shield. It was never made to be used in battle, but more likely as a Jousting Tournament Prize or Parade Shield. It was delicately painted with a scene of a Knight vowing his undying honour and chivalry to a Lady ( we've all been there haven't we fellas ?) with the spectre of Death appearing behind his shoulder, symbolising that he would Die first rather than dishonor her. I spent the best part of three hours soaking it all up, especially, the section holding my latest fad at home, Tiles and designing for tiles, and my camera filled up with 900 hundred year old ideas. These are floor tiles from a 12th century Abbey. But Time and Tide wait for no man, and I would be back again someday soon...,...... I had to get down to the river, just west of the city, and by Subway train I headed to my annual pub by Barnes Bridge, 'Ye White Hart', to team up with a couple of friends who are Exiled Oxford types, now living and working in London. 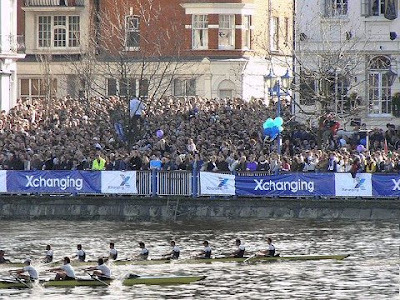 The University Boat Race, or the Boat Race, as it is now simply known, is, alongside the Grand National Horse Race, ( next weekend ) one of the National Icons of Springtime Sporting in the UK. I will guide you to the Wikipedia site for the full history. It has been happening every year since the late 19th Century, as part of a challenge laid down by the winners, from Oxford or Cambridge, to the losers, to turn up next year. Being an Oxford man, I have taken a beer by the river most of my adult life, as it is a breezy and a quintessential part of being English. We always chose Barnes Bridge, as it is less than a mile from the finish, which is always has enormous crowds, But by the time the crews shoot the spans of BB railway bridge, only once has the leader ever lost after that point. Oxford are in the lead in my Picture, and so from my last statement you will know that the next two foamy brown pints back inside the pub went down with gusto and relish, and a big smile when I spill some on my Oxford sweatshirt. I wave goodbye to my friends till another time, and catch a subway back to the centre of the city, to rendezvous with the Coach back to Oxford. and so I leave you with "The Prehistoric Camp" by Andrew Young ( 1885 - 1971 ) as it recounts a poets day trip ramble to the remains of an Iron Age hill settlement in the county of Dorset. Its race of men long flown. A wonderful tour (as usual) Sir Dayvd. 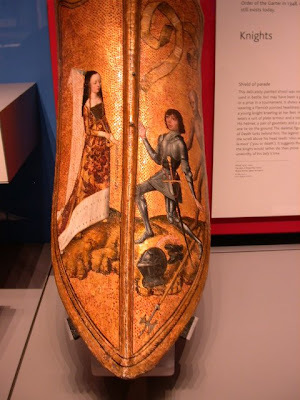 I love the idea of a Knights of Moleskine Jousting Tournament Prize or Parade Shield. Maybe my next woodworking project? BTW...ask Suz how does she know what its like to kiss a Stranger ! !